We All Benefit from foreign nations’ food crop diversity—but do our politics reflect this interdependence? Earlier this spring, the United States became the newest member of the International Treaty on Plant Genetic Resources for Food and Agriculture, a global agreement on sharing and caring for seeds. It’s a remarkable moment for an agreement whose central tenet is that all countries need one another, especially since it’s really hard to measure just how much they do. Here’s the argument: genetic diversity in food plants is an essential resource needed to keep crops productive, nutritious, resistant to pests and diseases, and tolerant to drought, heat, and other climatic challenges. Farmers need these traits to produce good yields, and plant breeders provide them by mixing and matching the genetic diversity found within the seeds of modern cultivars, ancient heirlooms, and even wild relatives to produce vigorous new crop varieties. So where do plant breeders find these seeds? Here’s where we get to international collaboration. 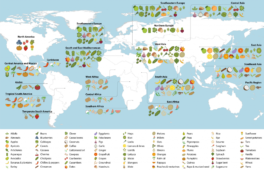 Crop genetic diversity increases with time: the places where food crops have been continuously cultivated for hundreds to thousands of years, and especially where they were initially domesticated many thousands of years ago, tend to be extraordinarily diverse. *Image: Origins and primary regions of diversity of major agricultural crops. From Khoury et al. 2016. Proc. R. Soc. B 283(1832): 20160792.